As we finally prepare to shut the coffin on 2017—or, as it’ll be known in the new calendar, Year One of the Trump Regime—it can be a real struggle to find something to perk up our hearts and put us back in the holiday spirit. (Or “Mandatory Christmas-time emotion,” as it’ll soon be legally known.) Luckily, the folks at Bad Lip Reading are here to help today, offering up a last-minute bit of holiday delight in the form of their latest take on marble-mouthed mumbler-in-chief Donald Trump. Titled “Christmas Is Here,” the new Yuletide anthem is a look back on some of the least depressing—albeit still very stupid—moments of Trump’s first year in office, from his horrible handshakes, to that time he stared right into the sun like a big dumb baby. 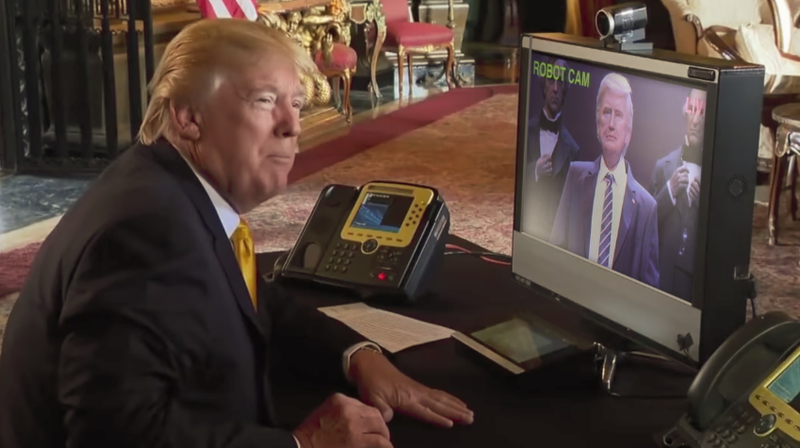 Featuring cameos from a dead-eyed Melania, quietly begging for help, the video ends on Trump finding empathy in his heart for the only thing on this planet that can stir that blackened little nub: A waxy robotic simulacrum of himself.